Wedding Backdrops London and Surrey – Drape Hire and Backdrops for London, Surrey and The South East. You may wish to cover your selected venue top to toe with drapes or perhaps just enhance certain key areas. Our Wedding Backdrops London and Surrey and venue draping service is designed to provide backdrops and drape hire that’s amazingly effective at transforming places like hotel conference rooms into beautiful, elegantly styled spaces. 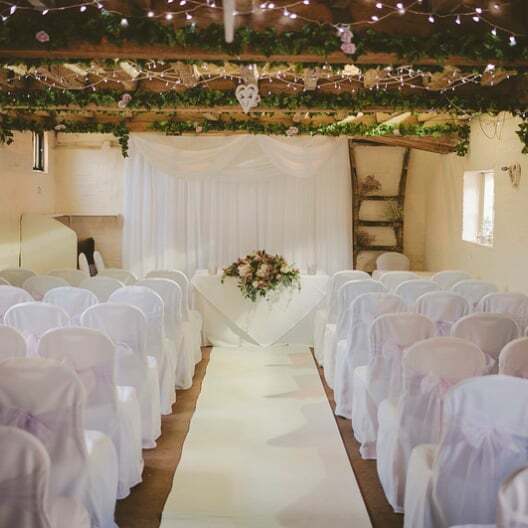 For over a decade we have provided wedding drape hire for hotel conference rooms, countryside barns, marquees, stately homes and beautiful castles throughout London, Surrey and the Southeast. Being a high quality and professional backdrops and draping company we are able to work with fabric straight from the roll and out of any type of material to create any style required. 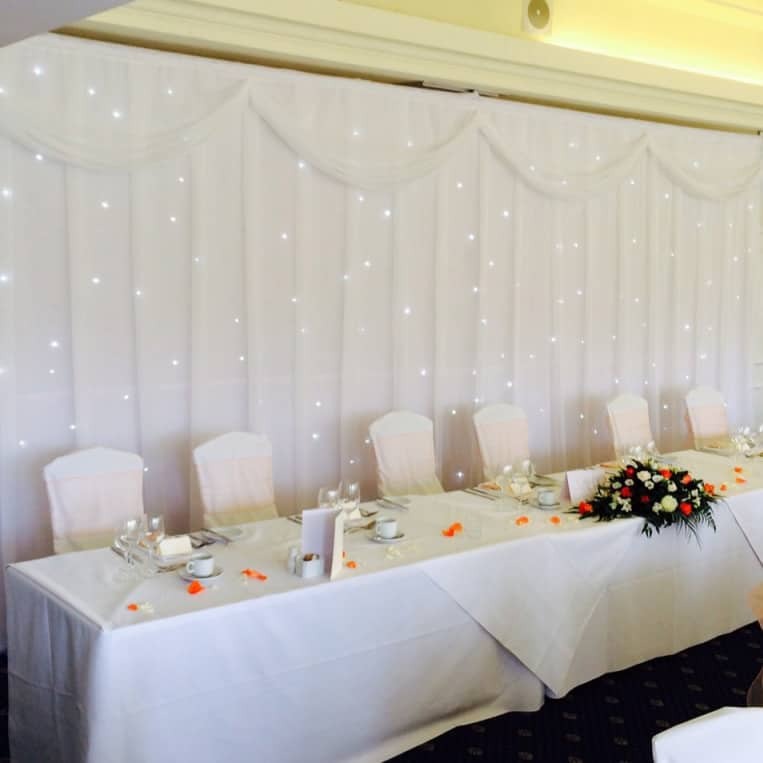 Our most popular drape hire products are white pleated drapes, white rippled drapes, marquee style draping, star cloths, fairy light curtains, and velour drapes. All of our venue draping Surrey hire products are fire retardant and come with official certification. 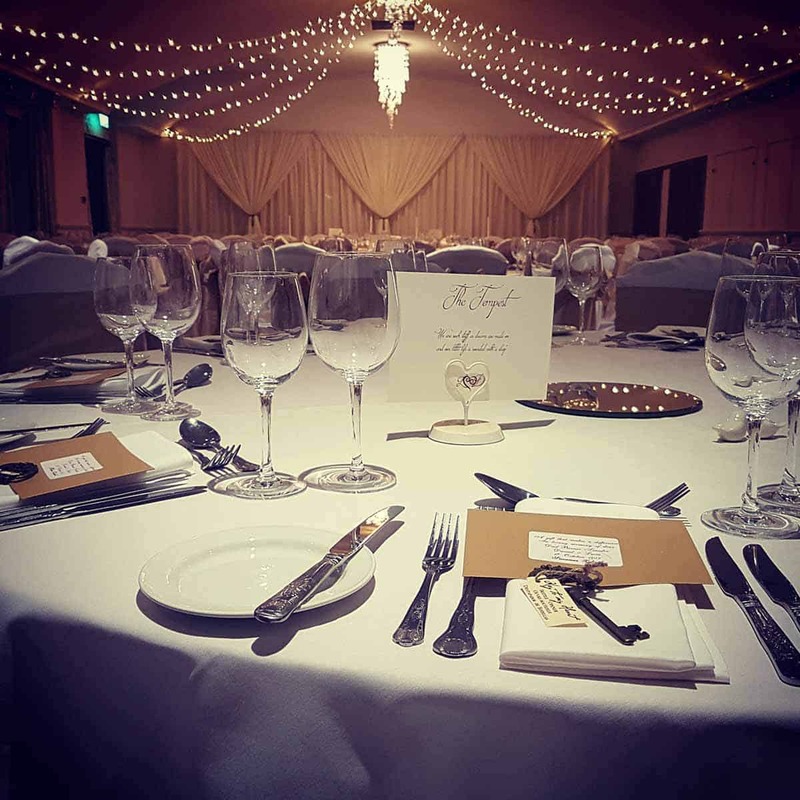 We provide a Venue Draping Surrey service but also work in London, Essex, Kent, Sussex, Hampshire, Buckinghamshire, Berkshire and throughout South East England. We are recommended suppliers at more than 20 of the top venues in the Southeast of England including Pennyhill Park, Wotton House, The Royal Berkshire Hotel, Kingswood Golf and Country Club, The Talbot and Pembroke Lodge just to name a handful. Every venue is different and so are our clients’ visions too, so please feel free to contact us to discuss your bespoke requirements. Top Table Backdrop – Wedding Backdrops London Surrey and The South East. A wedding essential! We specialise in bespoke backdrops that will create the perfect focal point to your wedding or event. The Top Table is always a key focus throughout any wedding reception, not just for photos, this is also the location that is most watched by your guests throughout the day especially during speeches and the wedding breakfast in general. It’s a relatively low cost item that makes a huge difference. Whether you would like a Starlight Backdrop, an Uplit Backdrop or a bespoke style designed just for you, our acclaimed Venue Stylists will be able to bring your vision to life. 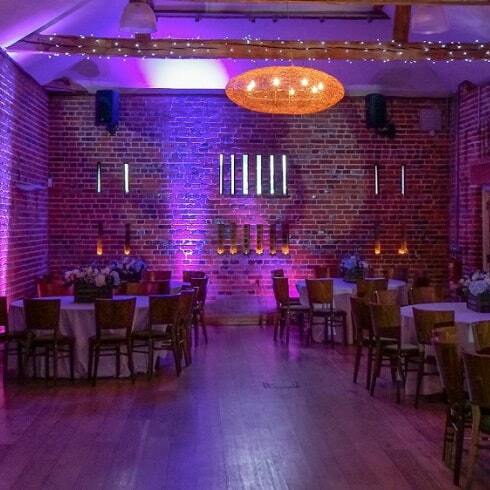 Up Lighting Hire – Up lighting Hire for London, Surrey and The South East. 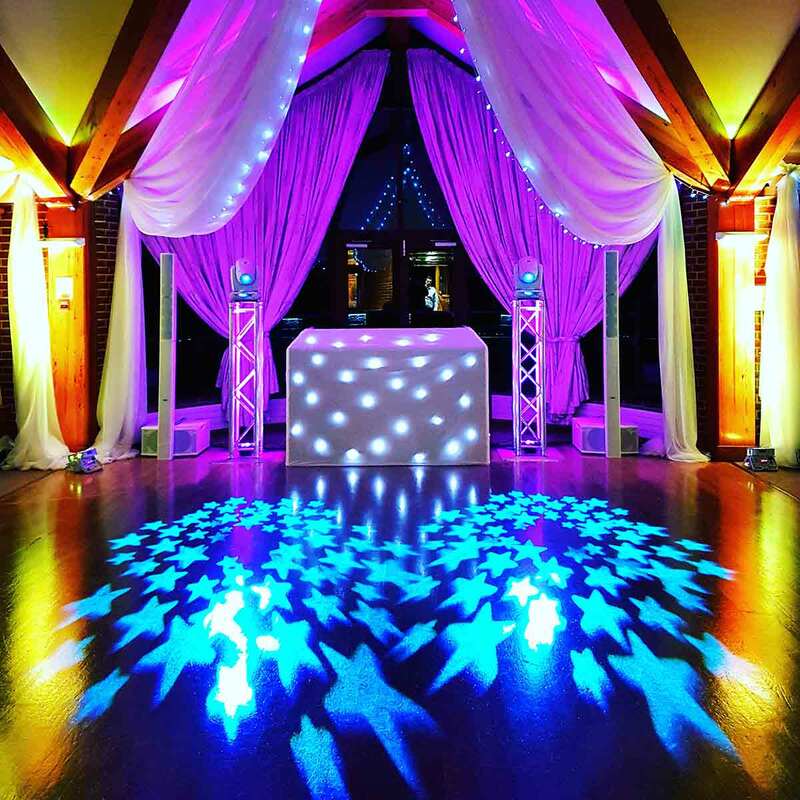 Our most popular enhancement of all time is without doubt Up lighting Hire (or mood lighting as it’s also known) which is all about the creation of ambiance using light, transforming venues by creating a stunning atmosphere. Bringing coloured light into your selected venue will complement your styling and set an intimate, romantic, chilled or even party mood. You can do this with either of our up lighter options, we have both powered or battery operated fittings. We can also provide 1m LED bar lights as well as LED par cans. Both types of light can be set to any colour you wish which is great if you want your walls to match your colour scheme or to highlight a particular feature. We can also program these lights to automatically change colour and flash, although static is very much the recommendation from us. Although most wedding drapes are white we do also stock many other colours. Our white wall drapes being the most popular are made from a much thicker type of fabric and are true white in colour unlike many other white drapes e.g. polyline and travera, which are very commonly used within our industry. Our drapes also have no limitation to height or width. We have completed drape heights of over 25m. If there are no attachment points within your selected venue we have a pipe and base system which allows us to erect our drapes almost anyplace and anywhere. We are highly skilled professionals and very experienced in venue draping, so whatever you wish to achieve with your venue styling we can make it happen – just as long as we have availability! Ceiling Drapes – Ceiling Drape Hire for London, Surrey and The South East. 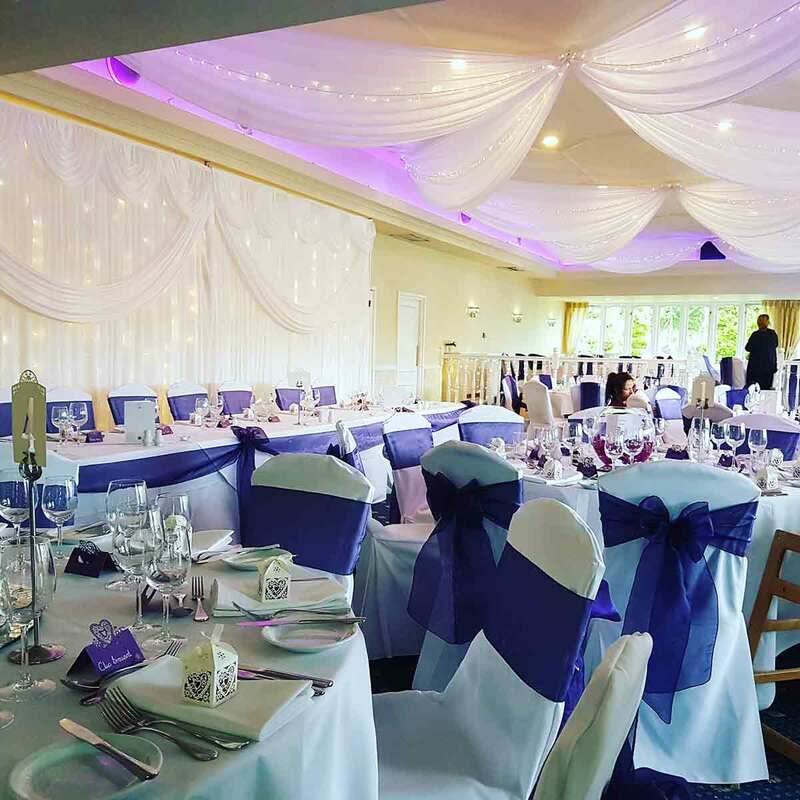 Ceiling drapes are a great way to enhance your venue, adding that extra special touch or simply making your ceiling lower to create a more intimate and romantic space. We can provide an array of different styles and colours, bespoke to the requirements of your venue. 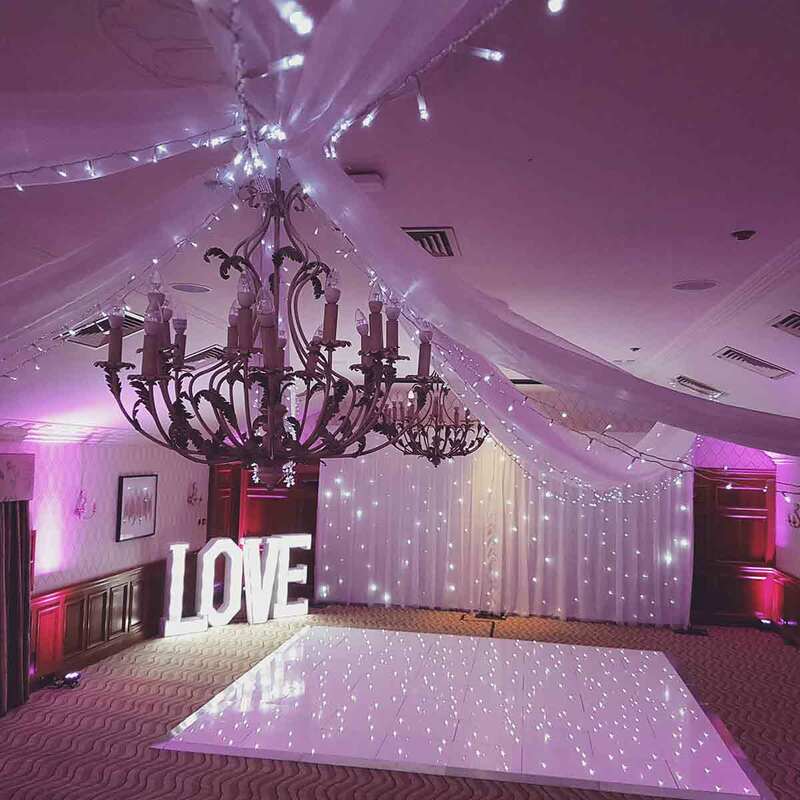 You can choose to have white or warm fairy lights to give highlights to the draping if preferred. We are also able to match the fairy lights in our backdrops to suit the overall design within your venue. Starcloth – Starcloth Wedding Backdrops London Surrey and The South East. Whether in black or white, Starcloths are great solution for transforming a bland room into something brilliant. Perhaps you may decide to cover a wall or completely cover a room, the results are instant. They are ideal for stage backdrops, creating a feature wall, either behind a DJ or band, or even a head table backdrop. All of our star cloths are made from high quality fire retardant fabric and come in standard sizes of 9m x 4m, 7m x 5m, 6m x 4m, 5m x 3m, 4m x 4m & 4m x 3m. We are also able to create custom lengths to suit your venue by folding back and clamping any unnecessary material. 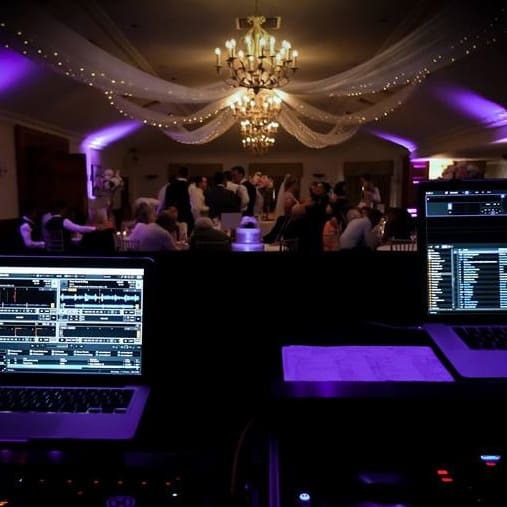 As a Multi Award Winning Mobile Disco and DJ Hire company we know the importance of lighting. People can feel self conscious about dancing in a overly lit room and likewise if too dark the room may become a unsociable space. Uplighting solves both issues whilst also being extremely pleasing to the eye. For information on beautifully draping and lighting your wedding venue, from Wedding Backdrops London and beyond, contact us now. Our backdrop and ceiling drape hire prices start from as little as just £250 plus vat, price is size and season relevant. To book or find out more about our Drapery or Backdrop Hire Services please don’t hesitate to call DJ2K on 0800 783 2928 or alternatively fill out the form below.